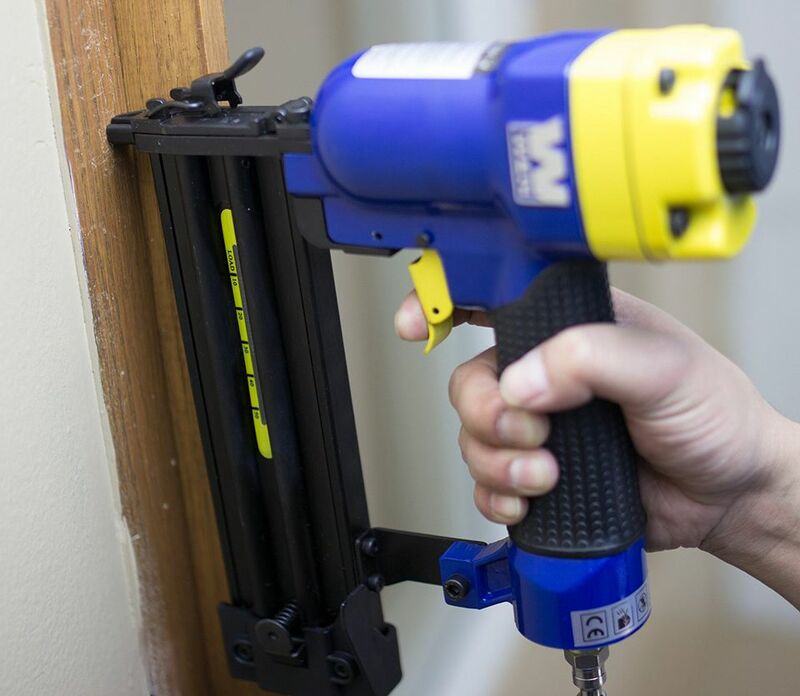 Finish nailers are designed to nail moldings and smaller trim boards onto assemblies with ease. The thin finish nails can be driven through the trim board into hardwoods, softwoods, plywood or other manufactured wood products such as MDF with a very small footprint, leaving behind a very small nail hole that can be filled using a wood filler before or after applying the finish. The thin nail is also far less likely to split the delicate trim board than a larger framing or other types of nail or wood screw and typically holds much better than an adhesive. The finish nailer is also much faster than nailing finish nails using a hammer, allowing the trim carpenter or woodworker to be far more productive. The finish nailer has the added advantage of being able to be used one-handed, freeing up the other hand for holding the trim or molding in place. Most finish nailers use nails ranging from 15-18 gauge, and the style of nailer is either straight or angled (meaning that the magazine that holds the nails beneath the nailer is either perpendicular to the nailing direction or at an angle of about 20 degrees). Nails for these nailers come in strips of 50-100, usually in boxes of about 2000 in total, and usually, ranging from 1-1/4 to 2-1/2 inches in length. Smaller finish nailers, commonly called brad nailers, will shoot very thin brads ranging from 5/8-inch up to 1-1/2 inches in length. Finish nailers have a safety nose that must be depressed before the trigger of the nailer will engage and be able to be pulled. Most finish nailers include a rubber, anti-marring tip that can be slipped over the tip of the nose to prevent the nailer from damaging the wood or molding being nailed. To use the finish nailer, position the tip of the nailer on the trim board at the location where you want the nail to be driven. Then, adjust the position of the nailer to drive the nail in the proper direction. In most cases, the nailer's cylinder and the tip should line up perpendicular to the face of the board, allowing the nail to be driven squarely into the board. In other cases, though, you may need to angle the nail to catch sufficient wood behind the trim or molding, so adjust your angle of the nailer accordingly. Once the nailer is aligned properly, push the nailer gently toward the wood, depressing the safety nose of the nailer, and pull the trigger. A finish nail should be driven directly into the trim at the desired angle. As with all power tools, be sure to wear appropriate safety equipment, including safety glasses, hearing protection where necessary and appropriate clothing. Finish nailers come in two styles, pneumatic and cordless. Pneumatic finish nailers are powered by compressed air via a hose from an air compressor. Conversely, cordless finish nailers utilize a combination of a rechargeable battery and a compressed air canister to drive the nail. Obviously, the cordless unit has the advantage of not being tethered via a hose, but because of the onboard battery, the cordless units tend to be a bit heavier. Costs are also a concern for both types of nailers. With a pneumatic nailer, you obviously need a decent air compressor and hoses to run the distance between the compressor and the area being nailed, so the initial costs are much higher than a cordless unit. On the other hand, with the cordless, you don't have such a large up-front expense, but you do have some consumables, specifically the need to purchase more air canisters when the current canisters run out. If the required canister isn't available at your local lumberyard or home center, you may need to order more online or else your cordless finish nailer will be unusable. When working with a finish nailer, you want the head of the finish nail to be sunk just below the surface of the trim board or molding so that it can easily be filled with nail filler. If the nails aren't being fully sunk, you can drive them in using a hammer and a nail set, but that is extra work that you shouldn't have to do. The problem typically is caused by either insufficient pressure from the air compressor, or the depth adjustment dial on the finish nailer needs to be rotated until the nails are driven to the appropriate depth. Check the operating manual for your particular finish nailer model for instructions on how to modify the depth adjustment. One other problem that occasionally arises is a jam in the head of the finish nailer. Nearly all finish nailers have an easy-to-open latch on the front of the nailer that can be opened and the jammed nail(s) removed. For safety, disconnect the nailer from the air compressor or take out the battery and/or air cartridge before opening the latch to remove a jam.